Evan Wondrasek is the founder and editor-in-chief of Techerator and is a software engineer in Minneapolis, MN. Evan holds degrees in Electrical Engineering and Computer Science and is also the creator of MarkdownPad. 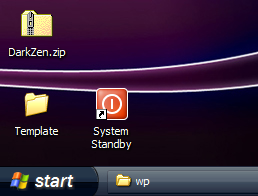 This guide will show you how to create a System Standby shortcut for your Windows computer, which will allow you to manually activate Standby mode by simply double-clicking an icon. What is standby mode, you say? Create a new shortcut (right click, select New -> Shortcut). Click next and name the shortcut. I chose System Standby. (optional) Add an icon to the shortcut. Right click the Standby shortcut. In the Shortcut tab, select Change Icon. A red Power On/Off icon is available in the bottom row. Have any other power management tips? Share them in the comments.